Who knew that practically right under our noses on the corner of Washington and West 11th Street exists a pretty terrific and lovely restaurant we had never even heard of, filled with enough modern art to feast our eyes, as well as a plethora of modern Viennese treats to make for a particularly delicious and leisurely brunch? Tucked under a giant Julian Schnabel painting at Wallsé, we enjoyed a first course of Bloody Marys made with fresh tomato water and “cucumber delight” cocktails made from pear-infused vodka, muddled cucumbers, elderflower syrup, lemon and Sekt. The meal continued with hits like spätzle, braised rabbit, wild mushrooms & tarragon, poached eggs, creamed spinach & Bavarian ham and a particularly amazing assortment of desserts including Salzburger Nockerl – a creamy soufflé of buttery meringue over a warm huckleberry compote – YUM! This documentary about famed Spanish Chef and food provocateur, Ferran Adrià and his legendary El Bulli (now, sadly shuttered) just blew our minds. Creative to the point of “avant garde” as Adrià puts it, this food is not for everyone. And much of it seems less like food than science. But it is definitely art. And watching this documentary about the creation and coming to life of one of the last season’s menus of what many called “the greatest restaurant in the world” is completely engaging. The personalities alone in that kitchen are worth the trip. Our favorite quote from the film: Ferran Adrià to his sommelier – “Our problem is, there are a thousand combinations. At the moment, the taste doesn’t matter to us. That comes later. At the moment, what matters is whether something is magical, and whether it opens up a new path. And later, in the restaurant, the dishes are created. Constructed. Now it’s more research and there is more research with creativity.” Simply riveting. Just at the height of our Downton Abbey withdrawal, this gem from 2008 reappears and satisfies with all the splendor, drama and “upstairs” British finery we’ve been longing for – based on the novel by Evelyn Waugh. Upon second viewing, we’re once again struck by the lushness of the setting, the wonderful taboo of the story and sheer magnificence of the truly disgracefully wealthy in the earlier part of twentieth century England. Beautifully directed by Julian Jarrold and starring Matthew Goode, Emma Thompson and Ben Wishaw who a year later went on to star in one of our all-time faves, the glorious Jane Campion beauty, Bright Star. Its chock full of everything period and pretty you want in a drama about obscene inherited wealth and class, including a perfect unseemly, disturbing underbelly. Enjoy! Did we say we were missing Downton Abbey? Well, this two-part Masterpiece Classic adapted from the modern classic, epic novel by Sebastian Faulk is just what we needed to get our fix of GORGEOUSLY filmed (touché, Director, Philip Martin & Cinematographer, Julian Court – this is absolutely STUNNING film, indeed!) 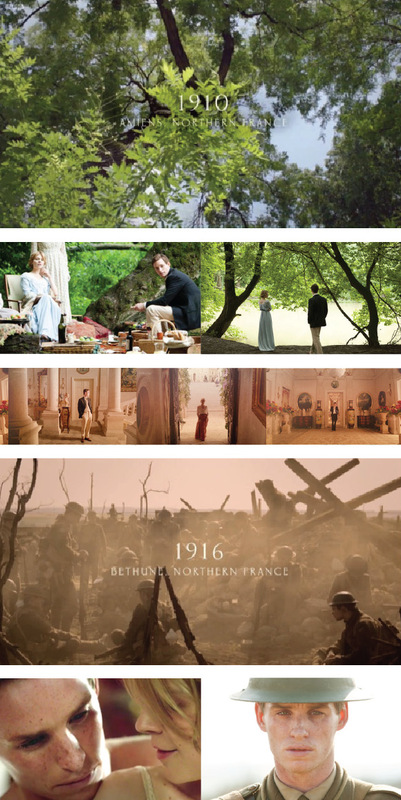 period drama with the backdrop of World War One. The Trenches are shot with amazing finesse and a gritty, dark reality, while the flashbacks of forbidden love in the French countryside (Manor house – with ALL the fantastic details) between Eddie Redmayne and Clémence Poésy just absolutely took our breath away. Though thoroughly cinematic in every way, we feel quite lucky that this is actually a TV series (BBC, of course) – as we get feast our eyes on a full three hours of it and recommend you do the same! When a taste-making two-and-three-quarters-year-old requests that her third birthday party have a particular color scheme, there’s only one thing to do: start making purple food and purchasing all things lilac through violet for the occasion. And with a house full of twirling, pointing and donkey-tail-pinning lavender ballerinas – what an auspicious occasion it was! Happy birthday, beautiful CeCe – we love you! !